Also as a consequence of the Potsdam conference, the occupation forces of all nations were obliged to ensure that German standards of living could not exceed the average level of European neighbors with which it had been at war, France in particular. Germany was to be reduced to the standard of life it had known in 1932.. The first "level of industry" plan, signed in 1946, stated that German heavy industry was to be lowered to 50% of its 1938 levels by the closing of 1,500 manufacturing plants. In Germany, shortage of food was an acute problem. According to Alan S. Milward, in 1946–47 the average kilocalorie intake per day was only 1,080, an amount insufficient for long-term health. Other sources state that the kilocalorie intake in those years varied between as low as 1,000 and 1,500. William Clayton reported to Washington that "millions of people are slowly starving". The US diplomat James Dobbins writes that an early draft of JCS 1067 had been written while the plan was still understood to be US policy, and "[b]ecause nothing replaced the Morgenthau plan once it had been disavowed, the final version of JCS 1067 contained many of the harsh measures and all the intent of a hard peace toward Germany". However, according to Dobbins, in May 1945 – shortly after its approval in April 1945 – the newly appointed deputy military governor, General Clay, implied that the directive was unworkable and initially wanted it to be revised; after the deliberate loopholes were pointed out to him, General Clay did not press further for a revision but "took great liberties in interpreting and implementing JCS 1067". Clay's good-willed effort did meet obstacles, like General Marshall forbidding him from relaxing the strict non-fraternization to a more reasonable level. Dobbins remarks that the harsh punitive measures shifted toward reform over time as the US faced with the problem of feeding millions of Germans and the Soviet expansion. Gerhard Schulz mentions that the American military government was, until 1947, operating under JCS 1067, which he describes as "a framework that had its origin in the Morgenthau Plan". Georg Kotowski also mentions that "As far as I know the results [of the revisionist debate], it seems to me that, although plans for a policy concerning post-war Germany had been developed as early as 1941, no plan had been adopted by the president that could have served as a basis for a purposeful policy. This resulted in the German question being postponed to after the final victory over the Axis Powers and Japan. At most, the short-lived approval of the Morgenthau Plan by Roosevelt might possibly be seen as a guiding principle of his policy toward Germany, especially since important elements of this plan found their way into [JCS 1067]." Michael Zürn talks of the policy of "Never again a strong Germany!" that found its expression in the famous JCS 1067 (which was influenced by the Morgenthau Plan), but this principle was abandoned by the USA soon after the Potsdam Conference, though it was not until 1947 that JSC 1067 was replaced by JSC 1779 and its related "European Recovery Program". Kindleberger states that "With the termination of hostilities, the mood of suppression gave way to ambivalence – in the West. Germany needed to be punished for wrongdoing, but it was also essential to revive the German economy for its necessary contribution to European recovery. The stern pronouncement of the Joint Chiefs of Staff Directive (JCS 1067) that the United States commander should do nothing to restore the German economy above the minimum level necessary to prevent such disease and unrest as might endanger the occupation forces gave way in July 1945 to an order to stimulate coal production for export delivery to Belgium, the Netherlands, and France" (which did not materialize). In May 1946, General Clay's stop-order on the dismantling of plants (for reparations) marked the first open recognition of the failure of Potsdam. After 1947, when conflicting policies began to be reconciled, economic and social conditions began to be improved. Henry Burke Wend refers to JCS 1067, as approved on 14 May 1945, as a compromise document which, "together with Truman's ascension to the presidency [on 12 April 1945], spelled the demise of the Morgenthau Plan". Despite this, "denazification, deconcentration and dismantling had a profound, if varied, impact on German industrial recovery." Even with the introduction of the Marshall Plan, self-defeating policies that simultaneously industrialised Germany (by investing billions of dollars) and deindustrialised it (through heavy dismantling of its industry) continued until 1948–1949. Walter M. Hudson describes JSC 1067 as less harsh than Morgenthau's plan: while core elements of the Morgenthau Plan were incorporated in JCS 1067, it was deliberately diluted, and permitted the military government to be more flexible than envisaged by the Morgenthau Plan. German historian Bernd Greiner talks of the failure of Morgenthau and the backward-looking political minority that supported him, stating that by the end of 1945 Morgenthau's staff had returned to the USA despondent, and those then in charge were not interested in "industrial disarmament". However, according to Greiner, the "Morgenthau myth" (German: die Morgenthau-Legende) was perpetuated in West Germany by right-wing extremist historians echoing Nazi propaganda and railing against an "extermination plan" for Germany by Jews and the left-wing intelligensia in America, while in Communist East Germany the Morgenthau Plan was presented as a western imperialist plot to destroy Germany. Wolfgang Benz, director of the Center for Research on Antisemitism at the Technical University of Berlin, states that the plan had no significance for the later occupation and Germany policy, though Nazi propaganda on the subject had a lasting effect and is still used for propaganda purposes by extreme right-wing organizations. Benz also states that Morgenthau had romantic agrarianist ideals which might mean that the intentions of his plan could have been beyond preventing conflicts. German historian Rainer Gömmel criticises the common claim by historians, including Benz, that the Morgenthau Plan was never implemented, arguing that core elements of the plan, namely the proposals for deindustrialisation, were adopted in August 1945 and became part of Allied policy. Germany is Our Problem is a book written in 1945 by Henry Morgenthau, Jr., U.S. Secretary of the Treasury during the administration of Franklin D. Roosevelt. In the book he describes and promotes a plan – named after him – for the occupation of Germany after World War II. Harry Dexter White (October 9, 1892 – August 16, 1948) was a senior U.S. Treasury department official. Working closely with the Secretary of the Treasury Henry Morgenthau, Jr., he helped set American financial policy toward the Allies of World War II while at the same time he passed numerous secrets to the Soviet Union, which was an American ally for part of the time and an adversary at other times. He was the senior American official at the 1944 Bretton Woods conference that established the postwar economic order. He dominated the conference and imposed his vision of post-war financial institutions over the objections of John Maynard Keynes, the British representative. At Bretton Woods, White was a major architect of the International Monetary Fund and World Bank. White was accused in 1948 of spying for the Soviet Union, which he adamantly denied. Although he was never a Communist party member, his status as a Soviet informant was later confirmed by declassified FBI documents related to the interception and decoding of Soviet communications, known as the Venona Project. Henry Lewis Stimson (September 21, 1867 – October 20, 1950) was an American statesman, lawyer and Republican Party politician. Over his long career, he emerged as a leading figure in the foreign policy of the United States, serving in Republican and Democratic administrations. He served as Secretary of War (1911–1913) under William Howard Taft, Secretary of State (1929–1933) under Herbert Hoover, and Secretary of War (1940–1945) under Franklin D. Roosevelt and Harry S. Truman. The son of prominent surgeon Lewis Atterbury Stimson, Stimson became a Wall Street lawyer after graduating from Harvard Law School. He served as a United States Attorney under President Theodore Roosevelt, prosecuting several antitrust cases. After being defeated in the 1910 New York gubernatorial election, Stimson served as Secretary of War under Taft. He continued the reorganization of the United States Army that had begun under his mentor, Elihu Root. After the outbreak of World War I, Stimson became part of the Preparedness Movement. He served as an artillery officer in France after the U.S. entered the war. From 1927 to 1929, he served as Governor-General of the Philippines under President Calvin Coolidge. In 1929, President Hoover appointed Stimson as Secretary of State. Stimson sought to limit worldwide naval build-up and helped negotiate the London Naval Treaty to that end. He protested the Japanese invasion of Manchuria, instituting the Stimson Doctrine of non-recognition of international territorial changes that were executed by force. After World War II broke out in Europe, Stimson accepted Roosevelt's appointment to the position of Secretary of War. After the United States entered World War II, Stimson took charge of raising and training 13 million soldiers and airmen, supervised the spending of a third of the nation's GDP on the Army and the Air Forces, helped formulate military strategy, and oversaw the Manhattan Project, which built the first atomic bombs. He supported the atomic bombings of Hiroshima and Nagasaki, which ultimately ended the war against Japan. 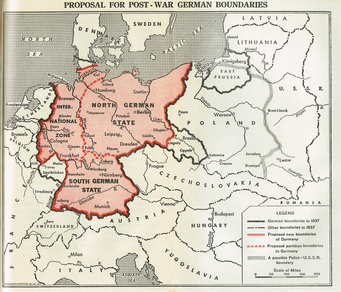 During and after the war, Stimson strongly opposed the Morgenthau Plan, which would have de-industrialized and partitioned Germany into several smaller states. He also insisted on judicial proceedings against Nazi war criminals, leading to the Nuremberg trials. Stimson retired from office in September 1945 and died in 1950. Henry Morgenthau Jr. (; May 11, 1891 – February 6, 1967) was the United States Secretary of the Treasury during the administration of Franklin D. Roosevelt. He played a major role in designing and financing the New Deal. After 1937, while still in charge of the Treasury, he played the central role in financing United States participation in World War II. He also played an increasingly major role in shaping foreign policy, especially with respect to Lend-Lease, support for China, helping Jewish refugees, and proposing (in the "Morgenthau Plan") to prevent Germany from again being a military threat by wrecking its industry and mines.Morgenthau was the father of Robert M. Morgenthau, who was District Attorney of Manhattan for 35 years and Henry Morgenthau III, an American author and television producer. He continued as treasury secretary through the first few months of Harry Truman's presidency, and from June 27, 1945 to July 3, 1945, following the resignation of Secretary of State Edward Stettinius Jr., was next in line to the presidency. Morgenthau was the first and only Jew to be first in the presidential line of succession. James Paul Warburg (August 18, 1896 – June 3, 1969) was a German-born Jewish American banker. He was well known for being the financial adviser to Franklin D. Roosevelt. His father was banker Paul Warburg, member of the Warburg family and "father" of the Federal Reserve system. After World War II, Warburg helped organize the Society for the Prevention of World War III in support of the Morgenthau Plan. John Jay McCloy (March 31, 1895 – March 11, 1989) was an American lawyer, diplomat, banker, and a presidential advisor. He served as Assistant Secretary of War during World War II under Henry Stimson, helping deal with issues such as German sabotage, political tensions in the North Africa Campaign, and opposing the atomic bombings of Hiroshima and Nagasaki. After the war, he served as the president of the World Bank, U.S. High Commissioner for Germany, chairman of Chase Manhattan Bank, chairman of the Council on Foreign Relations, a member of the Warren Commission, and a prominent United States adviser to all presidents from Franklin D. Roosevelt to Ronald Reagan. Today, he is best remembered as a member of the foreign policy establishment group of elders called "The Wise Men", a group of statesmen marked by nonpartisanship, pragmatic internationalism, and aversion to ideological fervor. The Marshall Plan (officially the European Recovery Program, ERP) was an American initiative passed in 1948 to aid Western Europe, in which the United States gave over $12 billion (nearly $100 billion in 2018 US dollars) in economic assistance to help rebuild Western European economies after the end of World War II. Replacing the previous Morgenthau Plan, it operated for four years beginning on April 3, 1948. The goals of the United States were to rebuild war-torn regions, remove trade barriers, modernize industry, improve European prosperity, and prevent the spread of Communism. The Marshall Plan required a lessening of interstate barriers, a dropping of many regulations, and encouraged an increase in productivity, as well as the adoption of modern business procedures.The Marshall Plan aid was divided amongst the participant states roughly on a per capita basis. A larger amount was given to the major industrial powers, as the prevailing opinion was that their resuscitation was essential for general European revival. Somewhat more aid per capita was also directed towards the Allied nations, with less for those that had been part of the Axis or remained neutral. The largest recipient of Marshall Plan money was the United Kingdom (receiving about 26% of the total), followed by France (18%) and West Germany (11%). Some eighteen European countries received Plan benefits. Although offered participation, the Soviet Union refused Plan benefits, and also blocked benefits to Eastern Bloc countries, such as Hungary and Poland. The United States provided similar aid programs in Asia, but they were not part of the Marshall Plan.Its role in the rapid recovery has been debated. Most reject the idea that it alone miraculously revived Europe, since the evidence shows that a general recovery was already under way. The Marshall Plan's accounting reflects that aid accounted for less than 3% of the combined national income of the recipient countries between 1948 and 1951, which means an increase in GDP growth of only 0.3%.After World War II, in 1947, industrialist Lewis H. Brown wrote at the request of General Lucius D. Clay, A Report on Germany, which served as a detailed recommendation for the reconstruction of post-war Germany, and served as a basis for the Marshall Plan. The initiative was named after United States Secretary of State George Marshall. The plan had bipartisan support in Washington, where the Republicans controlled Congress and the Democrats controlled the White House with Harry S. Truman as President. The Plan was largely the creation of State Department officials, especially William L. Clayton and George F. Kennan, with help from the Brookings Institution, as requested by Senator Arthur H. Vandenberg, chairman of the Senate Foreign Relations Committee. Marshall spoke of an urgent need to help the European recovery in his address at Harvard University in June 1947. The purpose of the Marshall Plan was to aid in the economic recovery of nations after WWII and to reduce the influence of Communist parties within them. To combat the effects of the Marshall Plan, the USSR developed its own economic plan, known as the Molotov Plan, in spite of the fact that large amounts of resources from the Eastern Bloc countries to the USSR were paid as reparations, for countries participating in the Axis Power during the war. The reconstruction of Germany after World War II was a long process. Germany had suffered heavy losses during the war, both in lives and industrial power. 6.9 to 7.5 million Germans had been killed, roughly 8.26 to 8.86 percent of the population (see also World War II casualties). The country's cities were severely damaged from heavy bombing in the closing chapters of the War and agricultural production was only 35 percent of what it was before the war. At the Potsdam Conference, the victorious Allies ceded roughly 25 percent of Germany's pre-Anschluss territory to Poland and the Soviet Union. The German population in this area was expelled, together with the Germans of the Sudetenland and the German populations scattered throughout the rest of Eastern Europe. Between 1.5 and 2 million are said to have died in the process, depending on source. As a result, the population density grew in the "new" Germany that remained after the dismemberment. As agreed at Potsdam, an attempt was made to convert Germany into a pastoral and agricultural nation, allowed only light industry. Many factories were dismantled as reparations or were simply destroyed (see also the Morgenthau Plan). Millions of German prisoners of war were for several years used as forced labor, both by the Western Allies and the Soviet Union. Beginning immediately after the German surrender and continuing for the next two years, the United States pursued a vigorous program to harvest all technological and scientific know-how, as well as all patents in Germany. John Gimbel comes to the conclusion in his book, Science Technology and Reparations: Exploitation and Plunder in Post-war Germany, that the "intellectual reparations" taken by the U.S. and the UK amounted to close to 10 billion dollars, equivalent to around 100 billion dollars in 2006. (see also Operation Paperclip). As soon as 1945, the Allied forces worked heavily on removing Nazi influence from Germany in a process dubbed as "denazification".By mid-1947, the success of denazification and the start of the Cold War had led to a re-consideration of policy, as the Germans were seen as possible allies in the conflict and the dawning realization that the economic recovery of Europe was dependent on the reactivation of German industry. With the repudiation of the U.S. occupation directive JCS 1067 in July 1947, the Western Allies were able to start planning for the introduction of a currency reform to halt the rampant inflation. This type of action to help the German economy had been prohibited by the directive and its execution also led to the setting up of a Soviet controlled puppet state in the eastern zone, to maintain Soviet control there. In 1948, the Deutsche Mark replaced the occupation currency as the currency of the Western occupation zones, leading to their eventual economic recovery.In 1947, the Marshall Plan, initially known as the "European Recovery Program" was initiated. In the years 1947–1952, some $13 billion of economic and technical assistance—-equivalent to around $140 billion in 2017—were allocated to Western Europe. Despite protests from many beneficiaries, the Marshall Plan, although in the less generous form of loans, was in 1949 extended to also include the newly formed West Germany. In the years 1949–1952, West Germany received loans which totaled $1.45 billion, equivalent to around $14.5 billion in 2006. "Restatement of Policy on Germany" is a speech by James F. Byrnes, the United States Secretary of State, held in Stuttgart on September 6, 1946. Also known as the "Speech of hope" it set the tone of future US policy as it repudiated the Morgenthau Plan economic policies and with its message of a change to a policy of economic reconstruction gave the Germans hope for the future. The Second Quebec Conference (codenamed "OCTAGON") was a high-level military conference held during World War II by the British and American governments. The conference was held in Quebec City, September 12 – September 16, 1944, and was the second conference to be held in Quebec, after "QUADRANT" in August 1943. The chief representatives were Winston Churchill, Franklin D. Roosevelt and the Combined Chiefs of Staff. Canada's Prime Minister William Lyon Mackenzie King was the host but did not attend the key meetings. Agreements were reached on the following topics: Allied occupation zones in defeated Germany, the Morgenthau Plan to demilitarize Germany, continued U.S. Lend-Lease aid to Britain, and the role of the Royal Navy in the war against Japan. Based on the Hyde Park Aide-Mémoire, they made plans to drop the atomic bomb on Japan. The Dog King is a 1995 novel by the Austrian writer Christoph Ransmayr. Its original title is Morbus Kitahara. A work of alternative history, it is set in Central Europe after World War II and the implementation of the Morgenthau Plan, which has deindustrialized the region and created a ruthless post-apocalyptic society. The main character is the son of a blacksmith who becomes the bodyguard of the only man in the area who owns a car. An English translation by John E. Woods was published in 1997. The book received the 1996 Aristeion Prize.